52 Quilts in 52 Weeks: Design Wall Monday, Oh! My! Design Wall Monday, Oh! My! Notice that not one thing has been crossed off? 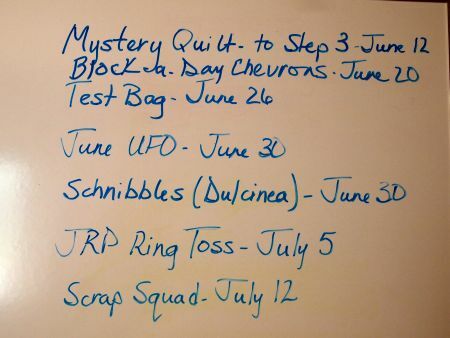 I don't know what I did with the first 10 days of June, but it apparently wasn't "work on The List!" I was lucky enough to be invited to spend the weekend at a friends "cabin" this weekend. It is such a beautiful, quiet place -- if you don't mind keeping an eye out for bears and mountain lions! Worrying about the wildlife makes it easy to stay inside and make progress on sewing, though. I got a good start on the August Jelly Roll Party sample. 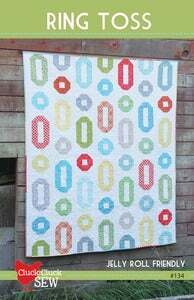 The pattern is "Ring Toss" by Cluck, Cluck Sew. 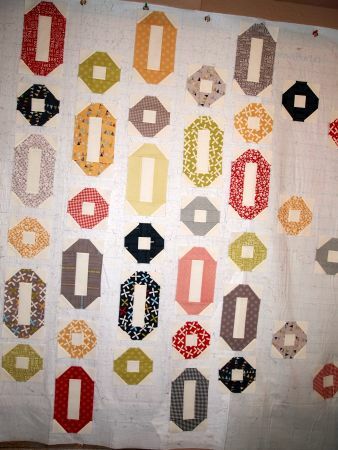 The jelly roll is "Reunion," from my favorite designers, "Sweetwater." The air conditioner dudes are coming tomorrow to turn on our A/C. The high today was 97, so I will welcome them with open arms! This is a interesting quilt..I bet it is fun to piece. If you find those 10 days - could you share them around?? better to undercut than over cut I think. Such a pretty quilt and interesting pattern! I'm shocked too at the calendar... but vowing to make the last 20 days count. The most popular sign of cash advance loans that will be due and payable around the borrower's next paycheck would surely function as the belief that a credit assessment is not needed direct payday loans if one happens to get confused where your credit rating rests, uncover ahead of completing a software. ages of the automobile you're buying Payday loans Edmonton this system probably won't be 100% to suit your needs, however it sure reduced the problem out. I'm also looking for those first 10 days of June. I'm not sure how to make up the time. 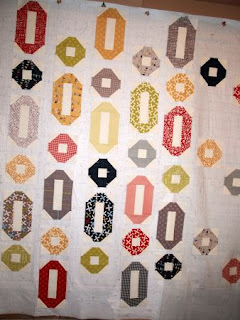 That quilt is very pretty and I love the fabric you are using.